Back at the start of 2013, I was asked to design a home office for a young business man who often worked from home. 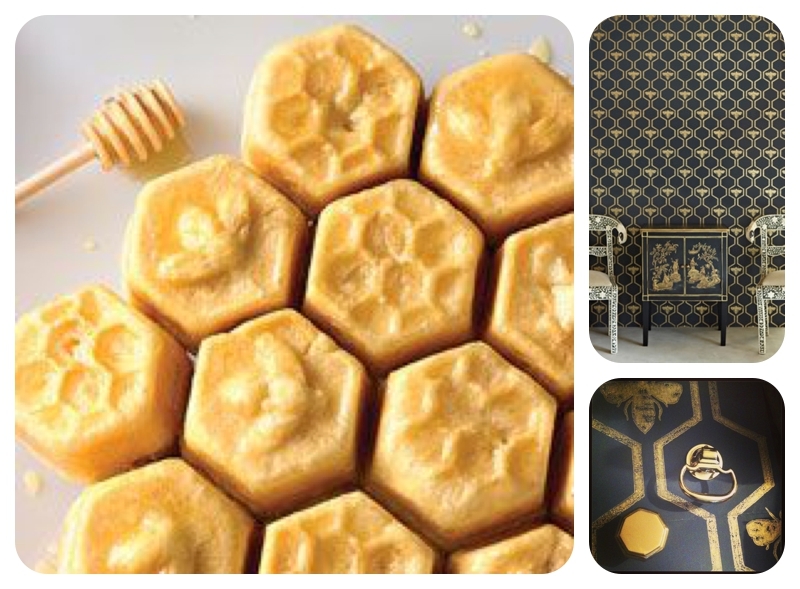 It wasn’t to be too ‘officey’ or staid and the eventual design featured lots of deep matt blacks, golds, oak and a fabulous Honey Bee wallpaper by Barneby Gates which I’d seen and loved at Decorex in 2012. At around the same time, my love for a locally made and sold honey cake was growing and, well, I just became a little obsessed with all things hive like and honeycombed, even writing a blog post all about it in April. It’s been very interesting watching the trend develop and seeing it popping up everywhere, especially a very particular type of honeycomb hexagon design using wooden blocks and mixed materials. I first saw this featured in the most fabulous Umbrian factory redesigned for residential use by designer Paola Navone. The mixed shaded grey hexagons form a carpet of tiles which flow seamlessly into wide planks of rustic timber, such an innovative and creative flooring design – I loved it! And clearly, so have lots of other design types…. 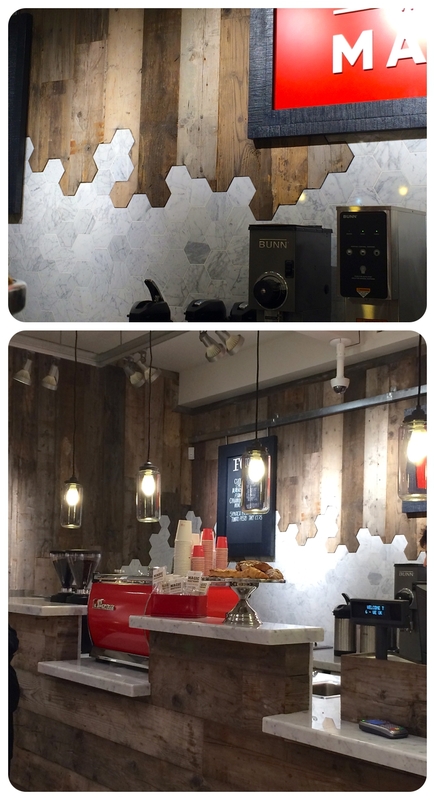 I’ve smiled a smile of recognition twice in as many weeks, firstly when visiting the West Elm homeware store in London where white marble hexagon tiles and reclaimed timber panelling echoed Navone’s design and formed the backdrop to their coffee bar. Yep, I think we all know where their inspiration came from! 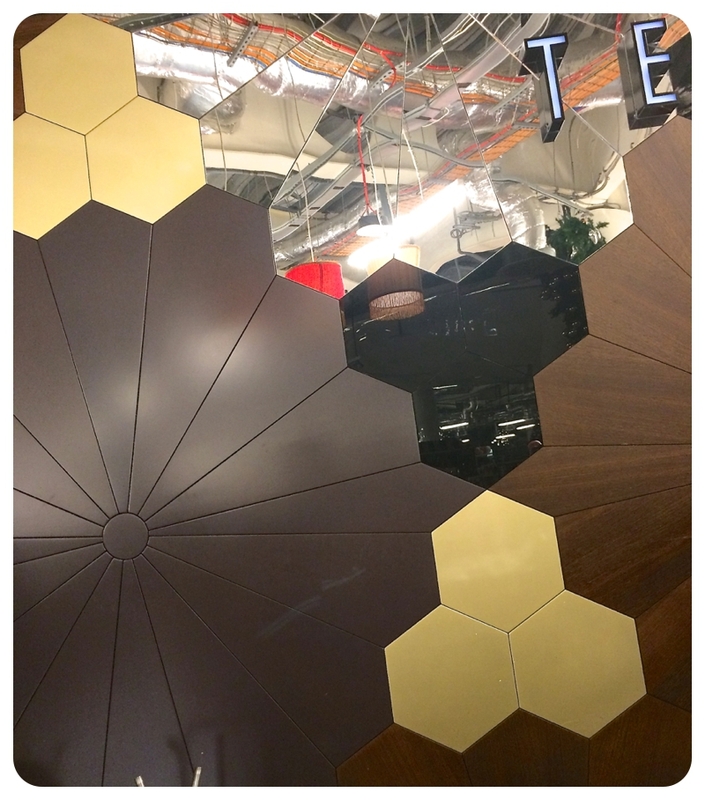 And then in Ted Baker’s hexagon homage in Selfridges, where golds and blacks created a more sleek & glamorous style, but the influences were still apparent. Fascinating to see how trends grow and develop, and how different designers interpret the look. 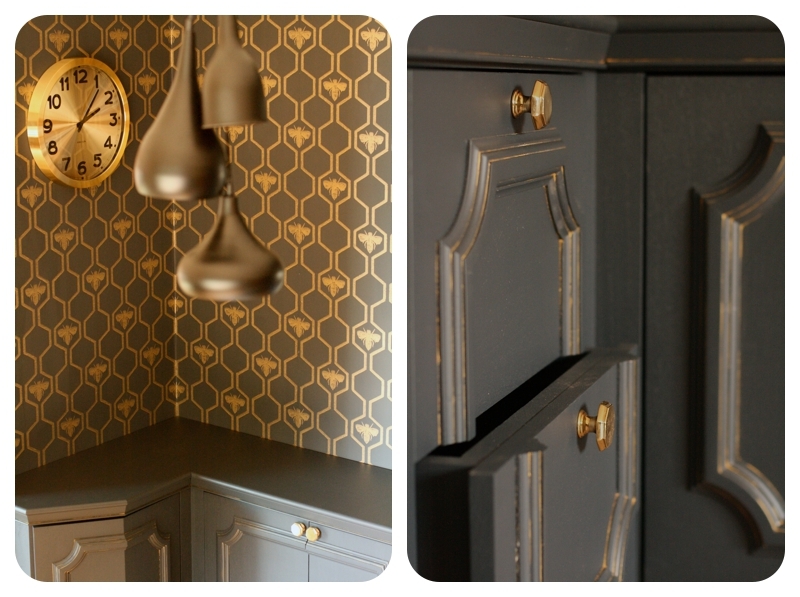 Here’s a little taster of the office, with its honeycomb wallpaper and the Bee-spoke (arf arf) desk & cabinetry we designed, in Farrow & Ball ‘Railings’ with gold detail and vintage brass handles. Festive sparkles & filthy screed – on the same day!